The World Health Organization Wednesday declared the end of Ebola transmission in Guinea, after the West African country successfully passed 42 days without a confirmed case of this fatal disease. Guinea was first declared free of Ebola in December. Since then, it has had two flare-ups of the disease. This West African country now has passed two 21-day incubation periods without a single case of Ebola. So the World Health Organization is declaring Guinea free of Ebola transmission for a second time. WHO spokesman, Christian Lindmeier tells VOA what Guinea is experiencing is not unusual. He notes both Liberia and Sierra Leone also have had outbreaks of the disease since having been declared free of Ebola. “We should expect flare-ups. That is what has been said before and what we have seen in the past--pockets of flare-ups. But, since the countries are prepared now…we are very confident that any flare-ups can be dealt with quickly and efficiently. But that is speculating far ahead, if all these 90 days pass by then the transmission of Ebola virus could be declared over,” he said. In the latest outbreak, seven confirmed and three probable cases of Ebola virus disease were reported between March 17 and April 6. Guinea now enters a 90-day period of heightened surveillance to make sure any new cases are quickly identified before they can spread to other people. 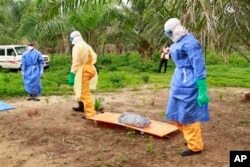 FILE - In this photo taken on Friday, June 19, 2015, the wrapped remains of a new born child suspected of contracting the Ebola virus, lays on a stretcher as health workers, dressed in Ebola protective gear, move the body for burial in Dubreka, Guinea. More than 11,000 people had died from Ebola in the three most heavily affected West African countries by the time WHO declared the transmission of the Ebola virus virtually over at the end of last year. More than 2,500 of these deaths occurred in Guinea. The World Health Organization says it expects Liberia will be declared Ebola-free at the end of its latest flare-up of the virus on June 9. Since the virus is resident in animals, mainly bats, WHO says countries must remain vigilant and prepared to tackle periodic outbreaks of the disease.